Cernan, 38, was a Navy captain with two previous spaceflights (Gemini 9, Apollo 10), Evans, 39, was a Navy commander making his first spaceflight, and Schmitt, 37, was a civilian also making his first spaceflight. 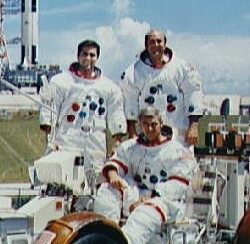 The backup crew for this mission was John Young, Stuart Roosa, and Charles Duke. The Apollo 17 command module capsule "America" is on display at the Johnson Space Center in Houston, Texas. Apollo 17 lifted off after a 2 hour, 40 minute delay due to a malfunction of a launch sequencer. Launch was on Saturn V from Pad 39A at Kennedy Space Center and was the first nighttime launch of an Apollo. On 11 December 1972 Commander Eugene A. Cernan and LM pilot Harrison H. Schmitt (the first scientist on the Moon) landed in the Taurus-Littrow region of the Moon while CM pilot Ronald E. Evans continued in lunar orbit. The LM landed on the southeastern rim of Mare Serenitatis in a valley at Taurus-Littrow, at 20.2 N, 30.8 E. Cernan and Schmitt made three moonwalk extra-vehicular activities (EVAs) totaling 22 hours, 4 minutes. 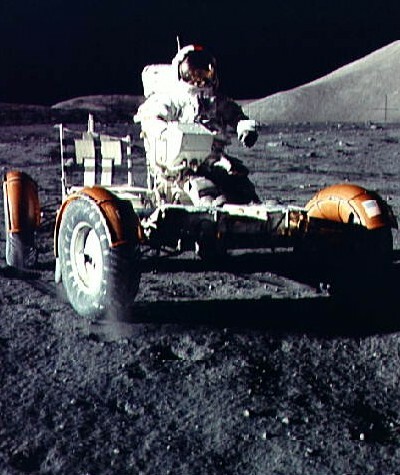 During this time they covered 30 km using the Lunar Roving Vehicle, collected 110.5 kg of lunar samples, took photos, set up the ALSEP and performed other scientific experiments. Evans performed experiments from orbit in the CSM during this time. The LM took off from the Moon on 14 December and the astronauts returned to Earth on 19 December. 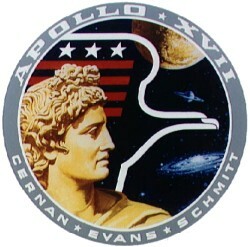 Performance of the spacecraft, the third of the Apollo J-series missions, was excellent for all aspects of the mission. The primary mission goals of investigating the lunar surface and environment in the Taurus-Littrow region, emplacing and activating surface experiments, performing experiments in lunar orbit, obtaining and returning lunar surface samples, and enhancing the capability for future astronaut lunar exploration were achieved.